Tonight’s (April 12) Belfast premiere is likely to be the final one before ‘Games of Thrones’ season 8 airs on HBO for its final season on April 14, in the US, and April 15 in the UK. Sophie Turner and Maisie Williams descended onto the Waterfront Hall in Northern Ireland for a special premiere alongside Kit Harington. Sophie Turner: I’ll admit, it has taken me some time to warm up to Sophie Turner as a Louis Vuitton ambassador, but this Pre-Fall 2019 gown is stunning. The actress looks so statuesque and so beautiful, I don’t understand why she didn’t wear this for the world premiere, as a gown like this deserves a much bigger stage – no shade to Belfast. Without even scrolling back on the other looks, I think it is safe to say this is my favourite Louis Vuitton look of 2019. 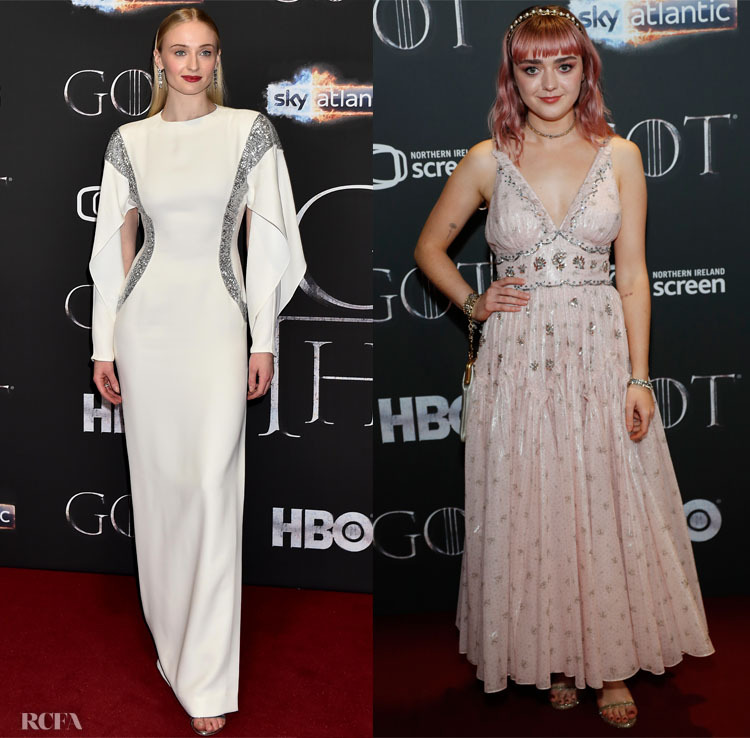 Maisie Williams: The actress, who is now sporting pink hair, wore a custom Coach blush pink cotton lamé prairie tea length gown with shimmering embellishment. Coach really knew their client, as this dress is the perfect embodiment of her style; uber sweet and girlie, with some vintage charms imbued. This was heightened by the Coach ‘Frame’ bag, an archival-inspired bag embroidered and personalized with Williams’ initials, plus a pearl accented headband.